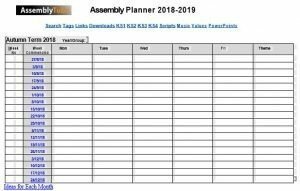 With our Assembly Year Planner you can plan your Assemblies for the year. Great for individual Assembly Leaders or for Assembly Rota planning. Lots of links to Assembly ideas. This is a Word document so you can edit to suit your needs. Click here to see an example showing how a school used the planner.